By looking at the science and research, this article shows whether these masks work or not. What is an Elevation Training Mask? Do Elevation Training Masks Improve Performance? Several approaches and modalities have been used to simulate altitude training at sea level. The convenience of these methods and the benefits on both aerobic and anaerobic capacity have increased the number of athletes and non-athletes that use these approaches. Among the novel methods, the Elevation Training Mask is a device that is claimed to simulate the benefits of altitude training. Moreover, a higher number of elite athletes have started using them in search of a competitive advantage/edge. Whether the Elevation Training Mask works as it is claimed has been intensively debated and recent studies have shown inconclusive results. Hypoxia – is a state where the tissue demand of oxygen exceeds the supply of oxygen. Hypoxic – is described as breathing a gas mixture which contains less than 21% oxygen. Normobaric – is a state of normal barometric pressure equivalent to that at sea level. Hypobaric hypoxia – is a condition where low pressure and reduced oxygen availability is present (e.g. high-altitude). Normobaric hypoxia – is a condition where normal pressure but reduced oxygen availability is present at terrestrial altitude (e.g. simulated altitude). Elevation/altitude training – is a training method used in an environment with a reduced partial pressure of oxygen. The aim is for the body to produce a greater amount of erythropoietin (EPO), which increases the red blood cells produced in the body. Exercising aerobically  and anaerobically [2, 3] at altitude has been proven to increase VO2max, as well as enhancing many other physiological adaptations (e.g. increased muscular power and hypertrophy). Several approaches and modalities have therefore been utilised to simulate altitude training, including normobaric hypoxia via nitrogen dilution (hypoxic department); supplemental oxygen; hypoxic sleeping devices; and intermittent hypoxic exposure . Furthermore, simulated altitude training has become increasingly popular for its convenience as opposed to a cold environment, harsh terrain, and low-oxygen pressure that often accompanies high-altitude training . In previous years, the various equipment used to induce hypoxia has been expensive, however, with the purpose of making this modality of training available to the broad public, new and more affordable devices have been introduced to simulate the same effects as elevation training in a more familiar environment . Doing so makes it more convenient for athletes to get similar effects without having to travel to high-altitude environments . One of these devices, the infamous Elevation Training Mask (ETM), is said to simulate altitude and to induce a normobaric hypoxic condition, or minimise the amount of air allowed to be consumed by an individual . An ETM is a patented pulmonary resistance training device that is currently a pioneer on the market. This device covers the user’s mouth and restricts air intake into dual channels and has an additional vent for the discharge of exhaled air. Additionally, the mask includes a variety of adjustable resistance caps, as well as three adjustable flux valves. Furthermore, the individual can progressively increase the resistance to simulate from 900 to 5,400 meters above sea level . The elevation training mask (ETM), also known as an altitude mask or ventilatory training mask, claims to enhance athletic performance by increasing endurance and VO2max; in addition to improving lung function . The ETM is also said to simulate altitude and to induce a normobaric hypoxic condition . The ETM provides adjustable resistances during inspiration with a set resistance on expiration in order to simulate high-altitude training (between 914m to 5,486m). The design of the mask restricts the oxygen flow using flux valves that limit the amount of air entering the mask, and therefore, the lungs . As a result of these claims, we will now delve into the scientific research and determine if any of them are true and if the ETM can have a positive effect on athletic performance. In this section of the article, we will now discuss and dissect the claims made about the ETM and whether or not it can actually improve athletic performance. A common misconception among users of the “elevation training mask” is that the ETM simulates altitude by creating a hypobaric (reduced partial pressure of oxygen) environment . For this to happen, however, the mask must have a mechanism to decrease partial pressure of oxygen and therefore induce a hypoxic state during exercise . Wearing the ETM does not produce a hypoxic stimulus great enough to elicit the necessary physiologic responses experienced at true elevation [6, 7] however, more research is needed to identify the specific physiological mechanisms that are elicited by this device . Although inconclusive, the ETM’s flux valve system and resistance caps can reduce breathing frequency during exercise, which can potentially result in arterial hypoxemia (i.e. low-levels of oxygen in the blood). This, in addition to a rebreathing of expired carbon dioxide, are likely to be responsible for the subsequent shift of the oxygen-dissociation curve (Figure 1 – ). Figure 1. The haemoglobin–oxygen dissociation curve . 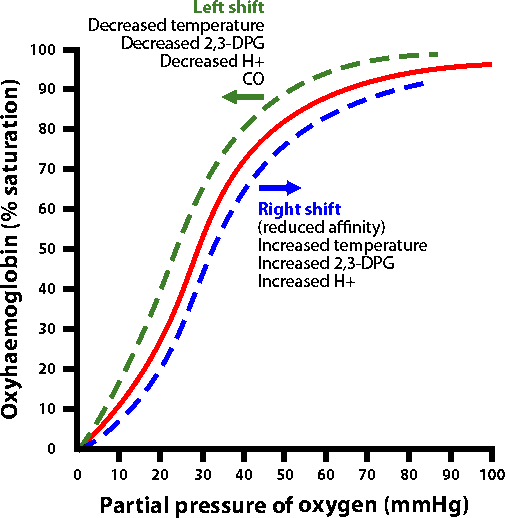 The haemoglobin–oxygen dissociation curve is a graphical representation of the relationship between oxygen satur­ation and oxygen partial pressure. This representation helps us to understand the underlying processes of oxygen transportation to the tissues . In line with the aforementioned, it has been suggested that rather than acting as a simulation of high-altitude, the peripheral air resistance generated by the ETM may directly stress breathing musculature, therefore, acting more as a respiratory muscle training (RMT) device . In theory, RMT may induce respiratory muscle fatigue and increase respiratory muscle strength, lung capacity, and oxygen efficiency over time . It is suggested that RMT may improve respiratory muscle strength and endurance as a result of an increase in cellular oxidative adaptations , which, in turn, can lead to a delayed onset of metabolic acidosis . The resulting lower-levels of blood lactate during exercise, as well as the reduced perception of respiratory effort after RMT, may ultimately lead to an increase in physical performance . In addition, wearing the ETM may result in significant increases in ventilatory threshold (VT) and power output at VT. Giving this, no changes have been found in haematological variables before or after training. This suggests that the ETM functions more like a RMT than a tool that simulates high-altitude training . Having said this, there is currently ambiguous data supporting the RMT as a potential method to enhance physical performance. Several findings suggest that improvements in RMT in respiratory muscle function are not transferable to VO2max or endurance exercise capacity [9, 10, 11]. There is little knowledge surrounding RMT in the literature regarding its benefits on exercise performance, or its effects on respiratory parameters [10, 11]. Using the ETM has shown to cause arterial hypoxemia, but in a different way compared to real altitude training. Using the mask causes inadequate ventilation, resulting in an imbalance between oxygen uptake and CO2 removal, and can, therefore, lead to hyperventilation. This, in turn, causes the ETM to increase the perceived exertion while training . Furthermore, when attempting to use the ETM in order to increase an individual’s VO2max, studies have shown inconclusive results. For example, some studies have found no significant difference in VO2max by wearing the mask [4, 12]. 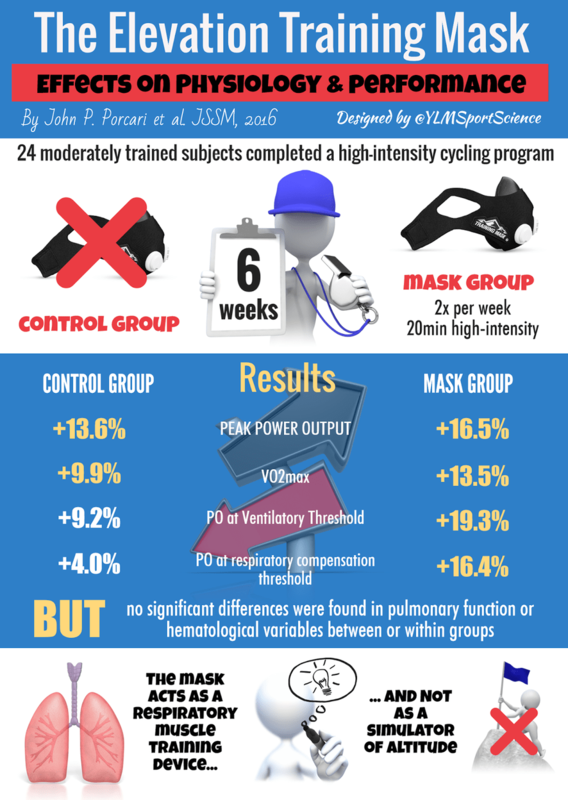 On the other hand, another study found an increase in VO2max in subjects wearing the mask, but importantly, it also found improvements in those who did not wear the ETM . It has also been stated that the ETM does not elicit a response for improving cardiorespiratory fitness . In line with this, as the ETM does not simulate an altitude environment, the desired effects of high-altitude training (e.g. increase in red blood cells) will not exist . 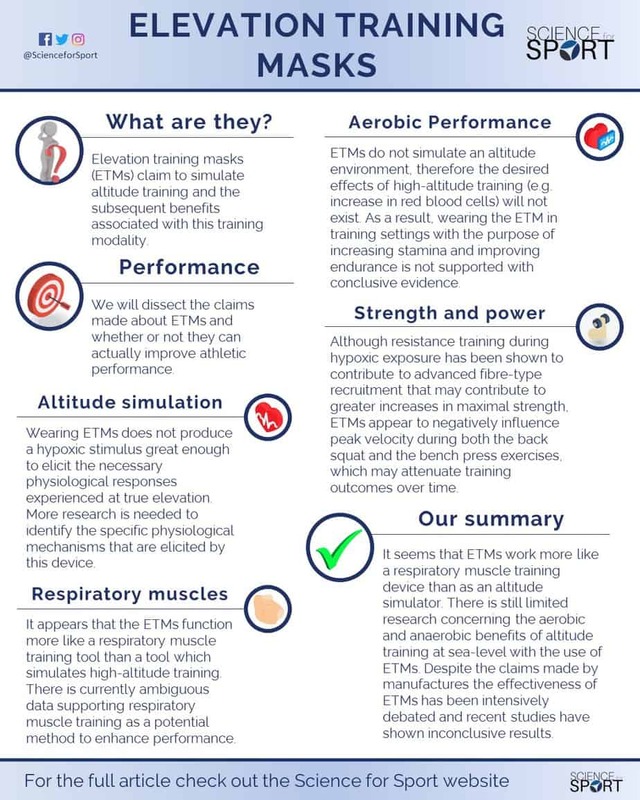 As a result, wearing the ETM in training settings with the purpose of increasing stamina and improving endurance is not supported with conclusive evidence. Finally, ETM is claimed to help athletes achieve better performance during high-intensity interval training and strength training, under the assumption that oxygen restriction may result in adaptations relating to an enhanced buffering capacity . This is also currently inconclusive and more research is needed to know if the ETM would compromise the ability to train at intensities high enough to elicit such adaptations . Moreover, its use does appear to negatively influence peak velocity during both the back squat and the bench press exercises, which may attenuate training outcomes over time . Whether strength training under hypoxic conditions can improve performance has recently been studied with promising results in terms of hypertrophy and muscular power [2, 3, 13]. Additionally, resistance training during hypoxic exposure has been shown to contribute to advanced fibre-type recruitment that may contribute to greater increases in maximal strength . However, in terms of the ETM and strength training, limited research is available regarding adaptations in strength and power performance when using the ETM. A study published in 2017 suggested that wearing the ETM while performing a strength training session appears to not only hinder the ability to maintain working velocity during the bouts, but also affect the athlete’s ratings of alertness and focus for the task . The true mechanisms behind the simulated altitude training and how similar/effective it is compared to other hypobaric methods. 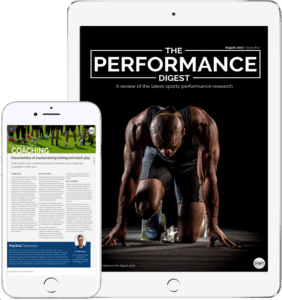 The relationship between the ETM and athletic performance (e.g. endurance and strength) and how the different features that are enhanced by the mask serve for a better performance. Which athletes/ sports may benefit the most from this training method? Although more research is needed, it seems that the ETM works more as a respiratory muscle training device than as an altitude simulator. Moreover, there is still limited research concerning the aerobic and anaerobic benefits of altitude training at sea-level with the use of an ETM. Furthermore, the gap in knowledge also extends to the effects of ETM on long-term health and cardiorespiratory fitness. Despite the claims made by the ETM manufactures and marketers in terms of improved endurance and strength capacities, the effectiveness of the ETM has been intensively debated and recent studies have shown inconclusive results. Finally, even though a larger number of elite and non-elite athletes have started to use the ETM to try and gain a competitive edge, it is vital that they understand the science behind the technology and whether or not they have actually been shown to work before using and marketing these products themselves. Sports Science entails many, many topics. 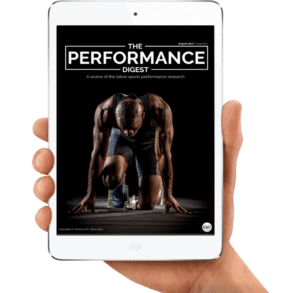 By choosing to simply read up on Elevation Training Masks and ignore the sea of other crucial Sports Science topics, you run the risk of being detrimental to your athlete’s success and not realising your full potential. To make you an expert coach and make your life as easy as possible, we highly suggest you now check out this article on Heart Rate Variability. Mario is a masters student in sport science at the University of Gothenburg and has a bachelor in sport science and in PE and health. 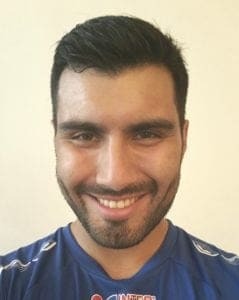 Formerly a semi-professional football player, he is currently working as a youth football coach for the Gothenburg football federation and holds a UEFA B license.